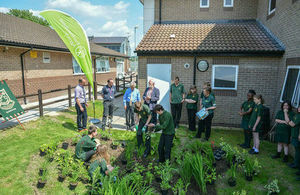 On 20 June, St Peter’s RC High School, working with the Environment Agency and Gloucester City Council, officially opened three raingardens. The raingardens will help improve the environment in the local brook and the school, and contribute to managing flood risk. Local MP, Richard Graham conducted the official opening, which marks the start of participation in a school-wide Sustainable Drainage Systems (SuDS) scheme. The first phase of the scheme, funded by the Environment Agency and designed by local firm Robert Bray Associates, will help to re-naturalise flows in the Whaddon brook and improve the environment in the school and the brook as part of the Gloucestershire Green Urban Rivers Project. Raingardens are one of a range of techniques that can be used to reduce and slow down the volume of rainwater running off hard, or impermeable, areas into drains. Raingardens like these could help improve water quality and reduce flood risk all over Gloucester if they are included in new and existing developments. We now have three beautifully designed raingardens for our students to enjoy that also has a functional purpose. The school’s Eco-Club students have been involved throughout the project planning and have helped with all the planting. The raingardens are a great resource for many areas including geography, science, maths, art and design technology. They are a super addition to the school and we are very grateful to the Environment Agency and Gloucester City for their support. What I’ve seen at St Peters will change how the school handles water run-off from Robinswood Hill and from classroom roofs. The three rain ponds and the school Eco Club that maintain them will absorb water and prevent flooding on the Whaddon Brook. And the idea can be replicated at other schools across the city, making a real difference to flood defences. It’s about partnership - with both the EA and the city council playing a key part.